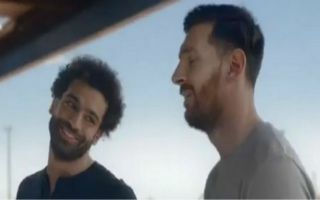 Liverpool winger Mohamed Salah goes toe to toe with Barcelona talisman Lionel Messi in Pepsi’s latest football advert. The two men have been in scintillating form for their respective clubs this season and they may be tough to separate when it comes to who wins this year’s Golden Shoe award for the most goals scored in a major European league. Salah has hit 17 goals in the Premier League so far this term, while Messi has 21 in La Liga and their impressive campaigns have earned them both a role in Pepsi’s new marketing campaign. The Egyptian star takes on the Argentine maestro in a superb trick-shot challenge during the 30-second advert, as they compete for the final Pepsi bottle at a petrol station in the desert. Check out the entertaining clip below, via Twitter.